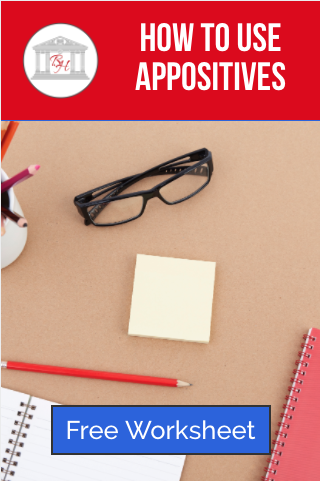 Appositives are a word, words, or phrases that can replace the noun in a sentence. They can seem complicated at first, but understanding how to use appositives will be simple for your child once they get the hang of it. Here are some tips to help your child master appositives. Commas always separate appositives from the noun of the sentence. They also directly follow the noun that they’re describing. For example, in the sentence “My mother, the best homeschool teacher ever, taught me about appositives”, the appositive is “the best homeschool teacher ever” which describes mother. Omitting the appositive does not change the meaning of the sentence. Appositives serve to give further description or explanation of the noun. If they are left out of the sentence, the clause is still independent and the meaning remains the same. For example, the sentence “Des Moines, the capital of Iowa, was originally named Fort Raccoon”. Getting rid of the appositive would keep the sentence meaning the same. The reader would just have to find out that Des Moines is the capital later in the reading or through research. The writer could also choose to leave the proper noun, Des Moines, out and leave the phrase as the subject of the sentence. For this reason, the appositive must contain a noun in the phrase. Adjectives or verbs alone cannot serve as appositives. In the sentence, “The child, upbeat and happy, ran to her mother”, “upbeat and happy” cannot stand alone as the subject. They are simply adjectives to describe the child, not an appositive. Appositives can contain proper or common nouns. The subject of a sentence may be a common noun, and the appositive may contain or be a proper noun. For example, “The capital of Nebraska, Lincoln, is the second largest city in Nebraska” has the subject “capital” and appositive, a proper noun, “Lincoln”. On the other hand, the sentence would also work in reverse. “Lincoln, the capital of Nebraska, is the second largest city in Nebraska” contains the subject “Lincoln” and the appositive “the capital of Nebraska”. Subjects and objects of sentences can have appositives. It doesn’t matter where the noun is in the sentence or how it’s used; an appositive can always follow. For example, the sentence, “The clown, a red-wigged silly young man, made magic balloons at the party” gives the subject “clown” an appositive. The sentence, “The clown made magic balloons, multiple inflatable animals, at the party” gives the object “balloons” an appositive. Teaching your child proper use of appositives shouldn’t be cause for stress. In fact, once they start practicing adding appositives after nouns in their writing or recognizing them in their reading, appositives are easy to understand and identify. 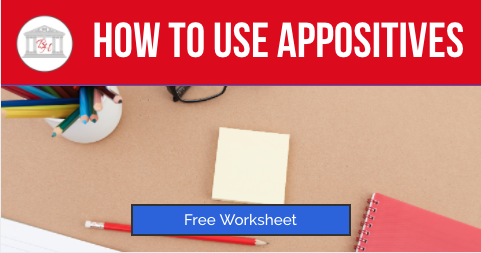 These tips will help your child know how to use appositives across the English and Reading curriculum. Join the newsletter to Grab Your FREE Worksheet! !